When I became a Mommy, there were many things I looked forward to experiencing as a parent. But, there was one thing the Coach and I decided on up front that he would take the lead on when the time was right. Watching animated movies with Georgia Peach(GP). I have a thing for bullet points (if you hadn’t already figured that out, I think they are great and very useful). I have little or no motivation to see dancing/singing animated characters in a full length movie. Sure, I have seen a couple since becoming an Adult but, I can count the ones I have watched from start to finish on one hand. The Lion King-Who hasn’t seen this classic, right? I get it. I’m not saying much with this one. Shrek-Hey, I am an Eddie Murphy fan. And to The Coach’s dismay, I find the movies Norbit (check out the awards for this film) and Bowfinger to be ridiculously hilarious. Again, I accept your judgement. The Incredibles-Any movie that has Samuel L. Jackson adding his yelling I mean acting voice to an animated character warrants a try. And let me tell you, it does not disappoint! Rio-I hear from those who watch these types of movies, I should not be proud to mention this one. Back to these movies…so, my thought was that when Georgia Peach was old enough to see one of these movies, I would buy the tickets for them. Their first Daddy/Daughter Movie Date, cute right? Obviously, I am too slow for them. 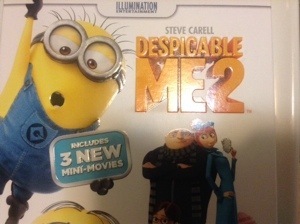 Check out one of the gifts GP got for Christmas from her Daddy, a DVD. I suppose it doesn’t matter that she hasn’t seen the first movie of the series? I share many of your feelings about kids’ movies. I have NOT seen The Lion King, and I am pretty sure Stella couldn’t handle it due to its sad themes, so I am safe on that one. But there are some really good ones out there…Despicable Me (1 and 2) are great; I think Chris and I like them as much as the Girl. We also enjoyed the Monsters, Inc. movies, Matilda, The Borrowers, and many more. My number one problem lies with Disney musicals. I wanted to crawl under a pillow every time I heard the Girl start up Rapunzel on the ipad. She went through a Little Mermaid phase (thankfully only about 2 weeks), and I’d find myself singing those damn songs and having flashbacks to the DHS show choir. I refuse to go see Frozen in the theater, and have instead made a deal with the Girl: When it is available on DVD or Netflix, she may watch it in a separate room from Mommy. I know I will end up watching some of these movies eventually, I just don’t want to! I LOVE animated movies( but movies in general are my thing) I think I get as excited as Aaliyah does.. Give Despicable Me 2 a chance! Its hilarious…I promise you will laugh!! !